Two huge oil tankers collided off the coast of Tobago in 1979. 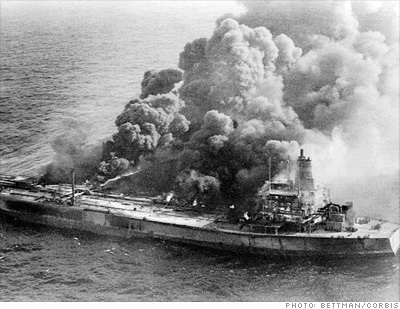 One ship was dragged to shore, the other burst into flames and was later hauled out to sea where it exploded and sank. It was one of the biggest spills in history, but there wasn't much cleanup, partly because the climate took care of it. The cargo was light crude, and it spilled in warm waters. This meant that much of the oil either evaporated or fell into the ocean in clumps, which were broken down by microbes. Also, a substantial amount had burned off during the crash. Not too many scientific studies followed up on the environmental impact of the crash, says Tunnell. "If it's not in a popular place and there's not a hue and outcry of the people that live in the area, probably not much is going to happen."  Why is there no safety.gov?